A "Candid Camera" in India? I am a regular on the Chennai-Bangalore Shatabdi express, doing the trip at least 3-4 times a month. In some coaches, there's a TV mounted half-way down the coach, and these show various short TV shows for the entertainment of travelers. While I've enjoyed watching re-runs of Charlie Chaplin's silent black-and-white comedy clips, the one thing that always gets my attention is the version of "Candid Camera" that they always show. You know the drill - the producers set up a prank, and then lure unsuspecting passers-by into participating in it. After the climax, they reveal that the victim has been on Candid Camera. Almost always the person who has been subject to the prank breaks out into a big smile, often of relief. (Of course, the producers could have selected only the nice clips for viewing). You can view some clips here. I think the Candid Camera situations reveal how people really behave when they don't know the camera is looking. It offers a mirror on a society and its people. Are they honest? Do they laugh at themselves. Do they take responsibility for their mistakes? Do they own up? Do they help others? Do they run away? Do they steal when nobody is looking? Do they stand up and stop a thief when they see him/her thieving? 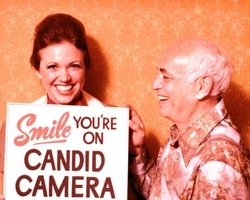 Candid Camera holds a mirror to ourselves, and what it shows can be revealing. I'd love to see what a Candid Camera program in India would show. How do Indians answer some of these questions I've asked? This would make for a hilarious, yet revealing TV show, in my opinion. Any TV producers interested? Film and TV production students? It is 24th April today, and I'm standing from the fourth floor balcony of my flat in Chennai, watching the line form on the street below. I have two polling stations next door - one a corporation primary school and another a Women's social club. The trickle of keen early voters that I saw as I was returning from my run this morning has increased steadily. Unfortunately, my application to be included in the voter rolls was lost in the "system" and I'm going to have to sit this one out. My parents, who live with me, fortunately got in. So as I returned from my run this morning, while I was performing my post-run stretches to cool down, I struck up a conversation with the security guard in the building, Rajappan. He is registered to vote in his village, which is near Thanjavur. I asked him about how he chose his candidate between the various choices available. "Our thalaivar (leader) chooses for us," he said. "He tells us who to vote for and we do it." I had known that this is the way voting happens in our villages; my previous live-in cook, Mallika, had returned to her village in the previous election to make sure she voted according to the wishes of her leader. "If I don't show up and vote, he will not help me if I need it," she explained. 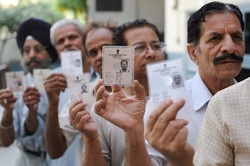 We may have a secret ballot, but I suspect people like Rajappan and Mallika believe that their all-powerful Thalaivar knows how they've voted. "Who is your Thalaivar supporting this time?" I asked Rajappan. "DMK," he said nonchalantly. Lofty notions of people like himself taking power into their own hands every five years and holding those they put into power accountable for their deeds and misdeeds while in office were obviously lost on him. The election was just another ritual by which he reaffirmed his loyalty to his Thalaivar who is the only person he could go to for help if he had a problem. And that was the only power that mattered. My father, who served in the Air Force for 39 years, rarely got an opportunity to exercise his franchise in the traditional way (going to a polling booth). 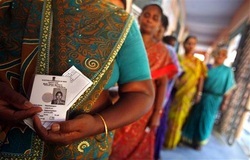 Every election, I remember a bright yellow envelope that would come to him with his postal ballot - the constituency he would vote in was the place listed as his "permanent residence" in the Air Force records - his sister's home in Tuticorin, Tamil Nadu. One never knows if those postal ballots reached in time, were counted, or were just lost. Member of Parliament Rajeev Chandrashekar, son of one of my father's old Air Force friends, launched a successful campaign to give members of the Armed Forces the right to vote in the place where they are posted, as long as they are not in a field location. Kudos to him for taking up this cause and securing the rights of those who work hardest to protect our democracy. Unfortunately, another class of people who work as hard, and perhaps in less comfortable circumstances, are members of our Para-military forces. During elections, they are rushed from place to place to ensure safe voting for everybody, but they don't have the right to either send an absentee ballot or vote where they are. This is a real travesty and should be addressed soon. Rajeev's work is a good first step, and I hope he takes up the case of members of the CRPF, CISF, BSF and other paramilitary forces soon. "Don't twist facts to fit your theories; when the facts do not support a theory, throw it out," said Sherlock Holmes to Dr. Watson, a number of times (or something to that effect, anyway). 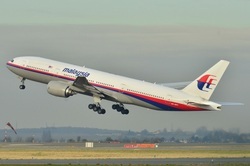 Oh, how could I resist not writing about the MH370 disappearance, given it's link to the themes of The Anza Deception and to, The Sympathy Wave. I think by now most facts point to either of two possibilities - a deliberate act, or an onboard malfunction that moved so quickly that both pilots could not react quickly enough to save the aircraft. The malfunction theories point to the possibility of an onboard fire, which started somewhere in the electrical circuits that control the aircraft's communication systems - ACARS (Aircraft Communications Addressing and Reporting System), then spread to the transponder and radios, before engulfing the pilots. They could have detected the fire, and tried to turn the aircraft towards a diversion airport (Langkawi is a possible target) but were overcome by fumes and perished. Under this theory, the aircraft should have crashed somewhere on a straight line between the point it turned and Langkawi. The distance depends on when the fire consumer the autopilot, and when the aircraft ran out of fuel. Boeing 777 aircraft are extremely stable - even with the autopilot disabled, the aircraft could have flown for hours before crashing. The other theory, that one or both pilots deliberately diverted the aircraft somewhere, is also supported by some datapoints. The best theory I've seen so far is from Capt. A Ranganathan, an experienced airline captain and contributor to The Hindu. Capt. Ranganathan has a coherent explanation for the various altitude changes made by the plane, and believes that it may be hidden somewhere to be used soon in a terrorist attack, a la 9/11. Chilling thought. You can read his article here. The search is currently being conducted in one of the most remote parts of the planet, off the coast of Australia. It remains to be seen whether the searchers find anything, and till then, we'll keep debating these two theories vigorously. By now, pundits around the country have done a fairly thorough analysis (given available information) of the mishap that struck INS Sindhuratna and resulted in the death of two brave young Navy officers in Mumbai. However, the bigger question is of the underlying causes that resulted in the Navy being forced to operate the submarine beyond its original decommissioning date, 2013. This appears to have been because of delays in procuring replacements to the Fleet of Kilo-class submarines. Does this story sound familiar? To me it definitely does. Many young fighter pilots have lost their lives because of delays in procuring parts and upgrades to our MiG 21 fleet. They have also suffered because we took long to procure an advanced jet trainer that could replace the Kiran Mk II and ease a pilot's transition from a piston trainer to the Mach-2 performance of the MiG 21. Delays continue to plague our procurement of the MMRCA, which is supposed to be the backbone of our Air Force for the next few decades. Lastly, DRDO has to take a large share of the blame. By making big and bold promises to ill informed politicians and bureaucrats in Delhi, and playing both the political game and the nationalist card to the hilt, they have delayed or deferred the procurement of foreign matériel but at the same time failed to deliver. The Air Force has stopped waiting for it's squadrons of LCA aircraft, and the grand project is likely to go the way of the HF24 Marut, which never made much of an impact on our force levels or capabilities. George Fernandes, when he was Defence Minister, famously posted a few Babus to Siachen to show them the effects of their delays in procuring winter equipment for the soldiers fighting under those challenging conditions. Will AK Antony do the same? A stint in the battery room of a submarine for a few months will surely be an eye opener for the paper pushers in the MoD. ﻿A racy political and investigative thriller. Matured writing. Unputdownable !! From military slush funds to shady land deals, from assassins and contract killings to loyal kingmakers, from cover ups to expose, from supercomputers snooping on the citizens to press conference on youtube and from Bogota to Bikaner, this novel has got everything and fills the void in quality Indian reading. The book is a racy political and investigative thriller. The plot and subplots are meticulously laid out by the author and aspects kept hidden from the reader only to be revealed at an appropriate time. Men of honour (officers from the military/RAW) are the sleuths who work like the CIA or Mossad. They work at great risk and little resources and fight the mighty machinery available to the megalomaniacs who have ridden a mock sympathy wave. The characters are strong. A Ludlum or Maclean was always missing in Indian writing. Ganapathy enters the arena with a bang to fill the void. I am eagerly awaiting his next novel. Thank you, book reviewers at Book Shop of India! !